So Gareth Seward and I have been havin' a bit of ye' ole' chin wag, and the upshot of it is... this new feature which is not yet out officially, as it needs another few days of tweaking and testing, but it seems to be going well. 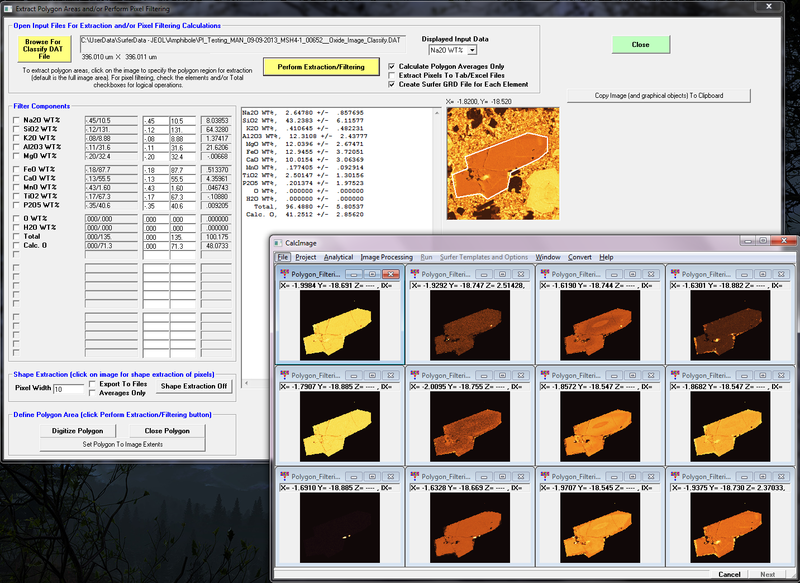 That said it looks to be pretty useful to all, and especially for students processing quantitative element maps off-line *without* access to the Surfer application. 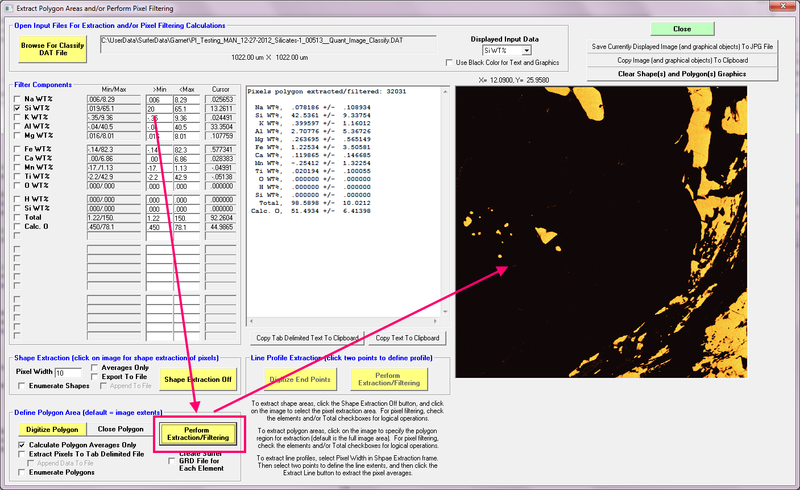 The cool thing, this feature will work for any data type created in CalcImage, so not just elemental quant maps, but also oxide wt.% maps, atomic % maps, formula basis maps, detection limit maps, etc., etc. Another few days of work and it should get interesting. 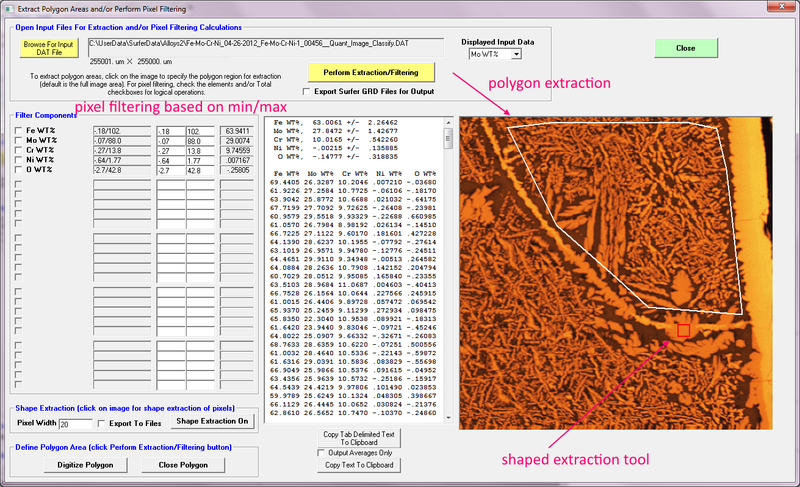 Our "first cut" at polygon extraction and pixel filtering is now available for download. Simply run the UPdate Probe for EPMA from the Help menu and you will obtain v. 12.5.2. 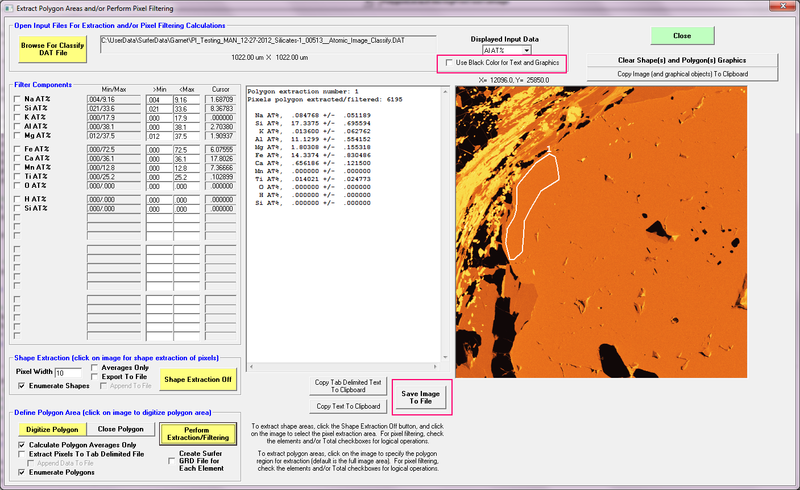 Then launch CalcImage and select the Image Processing menu, and select the new EXtract Polygon Areas and/or Filter Pixels menu. Gareth Seward will provide more operational details over the next few weeks, but it is quite usable already and we're sure you all will have many excellent suggestions to make (Gareth has already given me a list to work on for this weekend!). 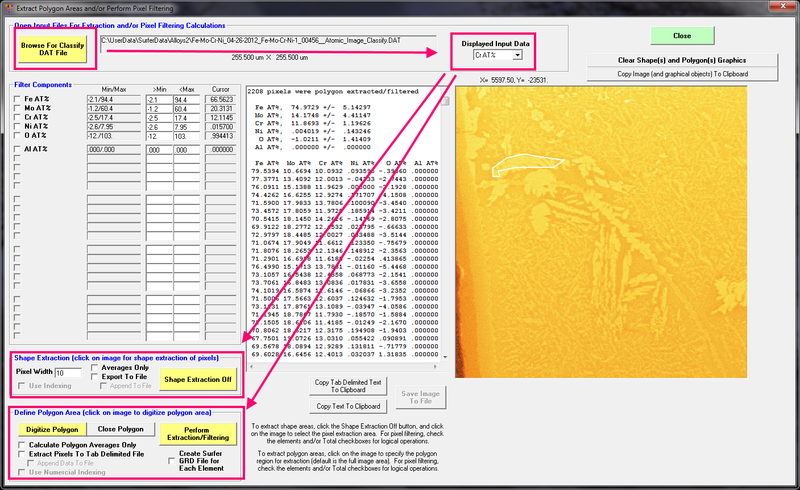 Then one selects the element data to display (remember, any data type output from the CalcImage quantification can be processed using this feature, including elemental, oxide, atomic, formula, etc., etc.). 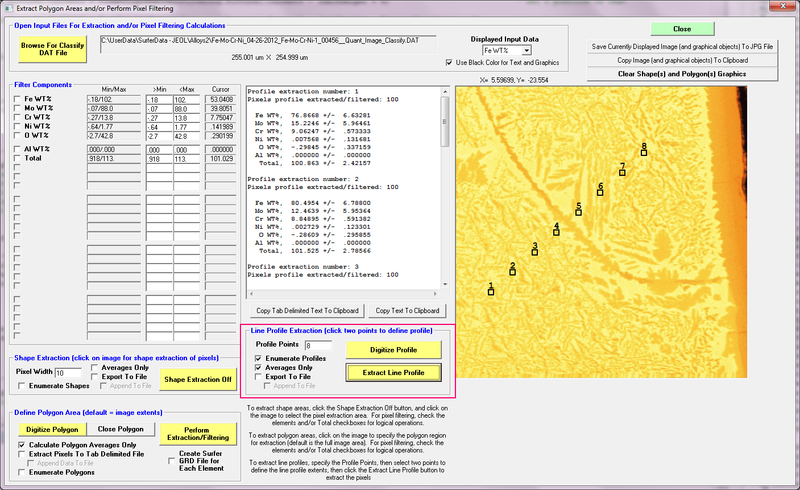 Then select either the Shape Extraction button (On) or the Digitize Polygon button to extract shape areas or polygon areas. 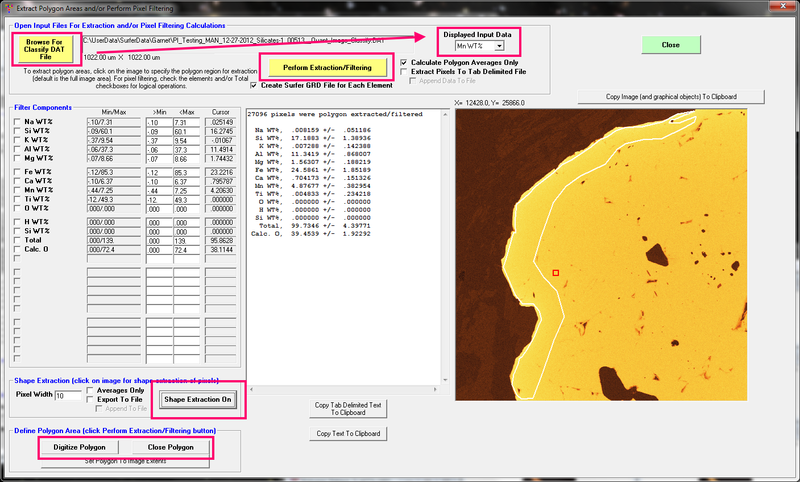 Finally, simply click on the image with the shape tool to see extracted pixels or click the Perform Extraction/Filtering to see the polygon extraction results. More details will be forthcoming. This update is ready to download now using the Help | Update Probe for EPMA menu. Just been playing with the new CalcImage. I don't have a copy of Surfer installed on my desktop computer so this is really useful! Thank-you, thank-you. Gareth and I worked pretty hard on this and we think it's pretty cool too. We're adding several additional cool features today, probably release a new version later tonight or tomorrow. Strater, Surfer and Grapher offer two licensing options: single-user licenses and concurrent licenses. A concurrent-use license, also called a “network” or “floating” license, is tied to a network. A license server be setup on the network for license distribution. The licenses are activated on the server computer and then the software on the user's computers connects to the server to see if a seat is available each time it is started. The product can be installed on as many client machines as desired. So I think it's OK to install another copy of Surfer in your office if you want to. To echo the earlier sentiments: this is really nice, thanks guys! In addition to the new GUI controls outlined in red, both the shape and polygon extraction method graphics can now be enumerated (graphically and also saved to text and files), using the Enumerate Shapes and Enumerate Polygons checkbox controls. So now only the quartz grains are showing. The image can be reverted to the unfiltered image by unchecking the element and re-extracting, or clicking on another element for display or re-loading the Classify .DAT file. Very handy to have this option directly in the Extraction window. Thanks! Output of .GRD for each elements is very important too, and really is the more complete output option, but the filtered image display is an instant sanity check! 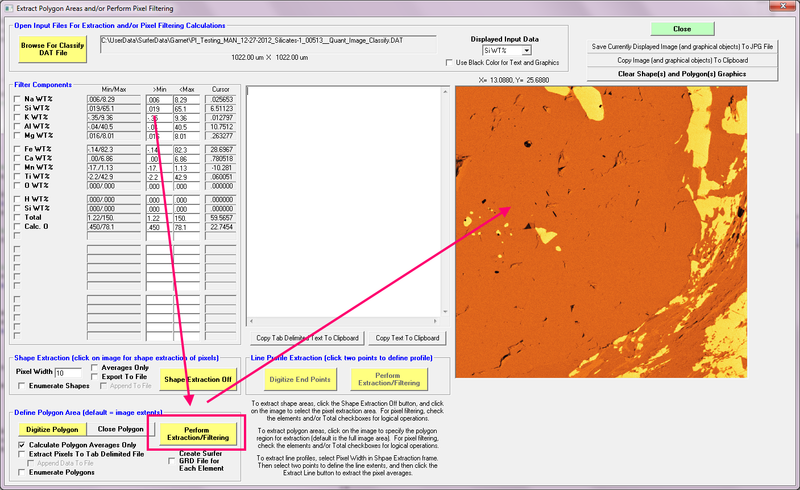 OK, we added a new Line Profile Extraction feature in the Pixel Extraction window in CalcImage. I've just tried the line extract - this is really nice - I'm keen to use it. 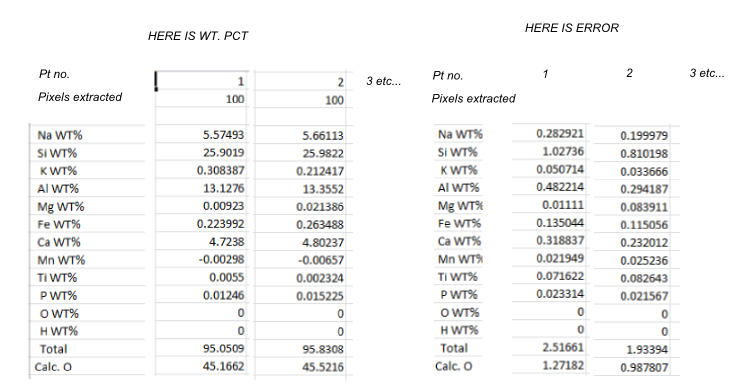 I'm having some teething problems with the export of points though, (a) the append to file does not seem to work, (b) it be nice to have data structured so that its ready to plot all points - each element forming a row or column, (c) copy clipboard as csv only copies last entry. It would also be great to have the relative distance between points. So the File Export works, but the Append does not? I'll check into this ASAP. How is what you are suggesting different from what it's doing now? It's complicated because there are two data types: averages and standard deviations only, and alternatively, averages and standard deviations and also all pixels. (c) copy clipboard as csv only copies last entry. When you say "last entry", do you mean the last pixel square? I will check. That makes sense. I should also output the center stage coordinate for each extraction shape. We fixed the append file output code. Sorry about that! We also fixed the tab delimited clipboard code. Had to create an array of average structures and a 3 dimensional array for the pixel output too. 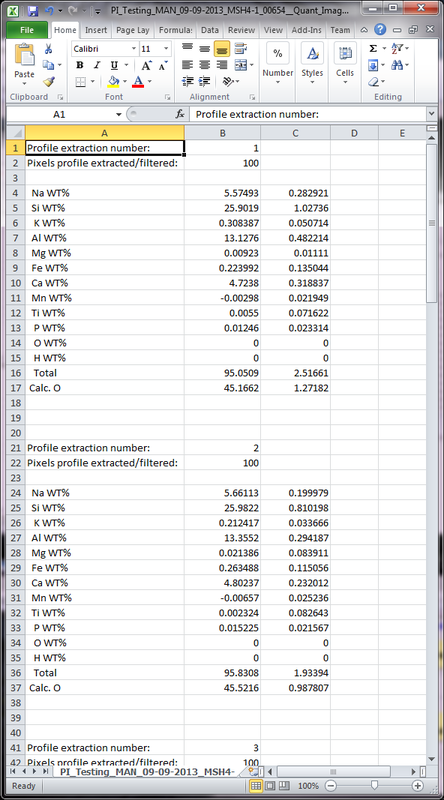 Next we will work on the relative distance output you requested. Good idea. Thanks for fixing it, it all works well now.